Why Does Gastro-esophageal Reflux Disease Occur? Gastro-esophageal reflux disease occurs when gastric acids from the stomach move back into your esophagus. Regurgitation (reflux) of these acids can also cause a number of symptoms : brackish taste in the mouth, cough, chest pain , asthma attacks at night and hoarseness of voice. The cardinal symptom of GERD is persistent heartburn, a burning sensation in the chest and the throat. Technically, gastro-esophageal reflux disease is a result of malfunction of the valve-like mechanism located between the esophagus and the stomach called the lower esophageal sphincter (LES). If the LES does not close properly - stomach contents leak back, or reflux, into the esophagus. Heartburn occurs when refluxed stomach acid touches the lining of the esophagus. As mentioned above, there are several different approaches to the treatment of gastro-esophageal reflux disease, as each of these approaches tackles the condition according to the way it perceives the condition. In this way, acid reflux surgery addresses the weakening of the LES and thus is aimed at strengthening it to block acid from touching the esophagus to prevent any inflammation. During acid reflux surgery, parts of the stomach are wrapped around the lower esophagus in order to prevent the refluxed stomach content to come into contact with the esophagus. Prescribed medications and over-the-counters, including antacids, PPIs and H2 blockers, appear to be very popular in treating GERD. Generally speaking, acid reflux medications address the excess acidity in the stomach. Unfortunately, these medications usually provide nothing more than a temporary relief and carry a host of side effects. The first kind of drugs is the PPIs or Proton pump inhibitors. This type of medication is aimed at blocking the mechanism in the stomach cells, which is responsible for releasing acid into the stomach. Hence, when the mechanism is blocked, the process of acid reflux stops immediately. The second type of prescription drug is the Antacids. Antacids are mainly concerned with neutralizing the acidity. The third type of prescription drug comes in the form of H2 - receptor antagonists. It is concerned with the functions of your gastric system. They actually halt the production of stomach acid production by working on the gastric system. The main downside related to the conventional medicine's approach to treatment, including acid reflux surgical and medicinal treatments, is that these approaches focus on the immediate, local or technical causes of GERD. Gastro-esophageal reflux disease is a complex condition caused by several behavioral, dietary and lifestyle factors. Adequate treatment for acid reflux must address the root of the problem, rather than constantly trying to prevent or relieve the external physical symptoms. · Drink plenty of water to detoxify the stomach. This is recommended even for healthy people but for people with acid reflux, they must drink enough water to keep the urine a light yellow color. · Herbs like anise, lavender, chamomile, and orange peel extract keep acid level in the stomach under control. · Massage abdomen with essential oils such as peppermint, anise seed, or chamomile dissolved in carrier oil like olive oil or jojoba oil. · Avoid fatty and fried foods, high sugar foods, caffeinated and alcoholic beverages. · Sleeping and lying down with the head and shoulders raised above the body lowers the chances of acid creeping back up into the esophagus. · Eating food at least three hours before lying down or bending over can also be of help as pressure on the stomach is avoided and the acid does not get a chance to reflux. · Avoid smoking, wearing tight clothes, and eating spicy foods. 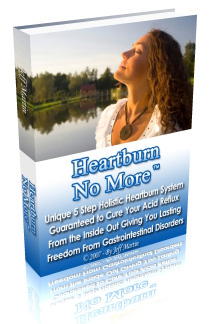 Unlike the short-term solutions that are designed to achieve immediate relief from the debilitating and sometimes painful GERD symptoms, the holistic approach provides an all-natural, comprehensive acid reflux treatment that can stop and prevent its recurrence safely and effectively.